Living on your own (and by living on your own, I mean not with your parents) is a lot of work. You have to take care of bills, set up a phone and internet plan, clean the bathroom, and remember to turn the heating on. You have to stock the fridge and the pantry. Which means you have to remember to get butter and baking soda and vinegar. Of course, you don't forget the essentials like chips and cookies, but it's much harder to remember to get the things that are necessary for making actual meals. Oh god, and making meals? Three of them a day? So much harder than it sounds. 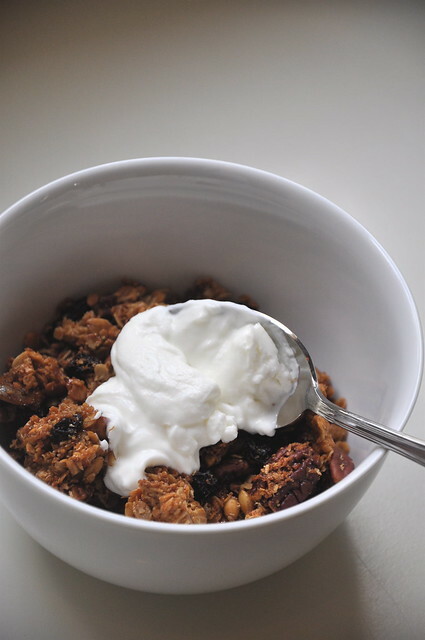 It's so much easier to eat a cereal bar than to make a bowl of oatmeal and cut up fresh fruit. 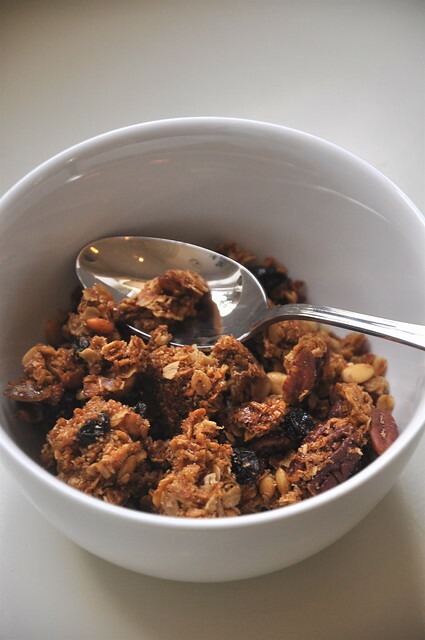 Who needs roast chicken and vegetables when there's cereal in the cupboard? Not me. I suppose having cereal for dinner is better than going out all the time. Because eating out every night would really add up, for my wallet as well as my waistline. Honestly though, after nearly a week of haphazard meals, I'm ready for real food. I whipped up a big pot of cauliflower-parsnip soup that I'll have for dinner tonight along with a salad and maybe even some roasted vegetables. I'll be able to freeze most of it, so I can pull out a cup at lunch when I'm at a loss for what to eat or on a hurried weeknight when I don't have time to make something fresh. Unfortunately, I can't really eat it for breakfast. I mean, I guess I could, but that's not all that appealing. 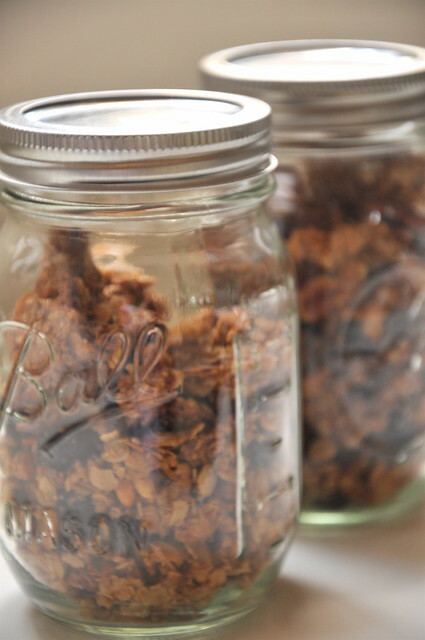 Instead, I think I'll just make a batch of this granola. It is seriously addictive. Once I make it, I truly cannot stop myself from eating it. My mom and I discussed the possibility of portioning it off into individual bags for fear of consuming the entire container in one sitting. It's just barely sweet and perfectly crunchy. I really hate when granola is soft and doesn't have big chunks. 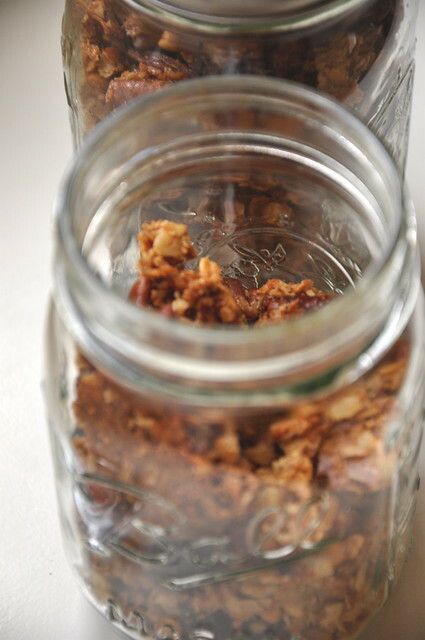 I usually hunt for the clusters, so this granola is even better as it is basically all clusters! Preheat oven to 300 degrees. Grease a rimmed baking sheet. 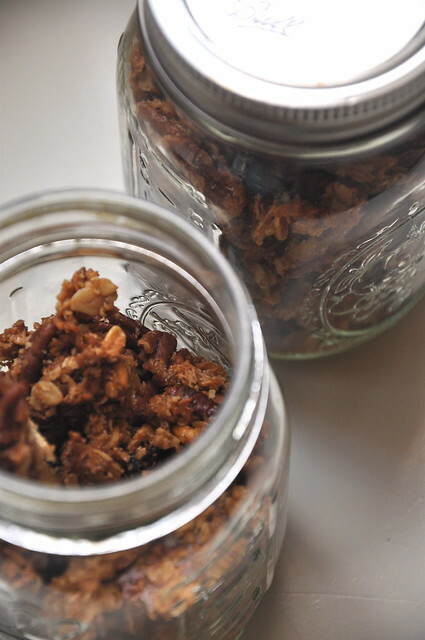 In a large bowl, combine oats, pistachios, pumpkin seeds, dried coconut, almonds, salt, cinnamon, cardamom, and raisins. Add brown rice syrup and olive oil and stir to combine. Spread mixture evenly over prepared baking sheet. Bake for 45 minutes, stirring every 10 minutes, until golden brown. Let cool. Transfer to a large bowl or serving container.